Our love of burgers is famous: we’ve eaten them throughout our American cheese-and-beef-loving country, tracking down the finest damn burgers in America and the best one to rep every state. All this burger eating made one thing clear: it's our American duty to take a deeper dive into some states' backroad burgers. From a simple, griddled, thin-patty diner burger in Al Capone’s playground of Hot Springs to a fresh-ground half-pounder at a crossroads pitstop in the middle of the wilderness, these are the best burgers in Arkansas. As an Arkansas spin on a meat-centric gastropub, Tusk and Trotter has bison, lamb, and beef burgers. But you’re in noted heart of Razorback country, so the only option is to eat a bunch of pig. The Hogzilla is a wild-boar patty topped with house-made bacon, face bacon jam, garlic aioli, lettuce, tomato, pickles, and onion on a squishy potato bun. Order it with a side of salt & pepper pork rinds and get your porcine fix for the next decade. For generations, Hog fans taking I-40 from Little Rock to Fayetteville for University of Arkansas games stopped in Russellville for a burger at the venerable Feltner’s Whatta-Burger. But, in 2005, CJ’s Butcher Boy popped up just half a mile away and turned Arkansas burger orthodoxy on its head. CJ’s burgers come as 1/3lb singles or 2/3lb doubles and are smashed and cooked flat on a griddle the second you order. They may be from the new guys in town, but they are old-school burgers in the best sense. 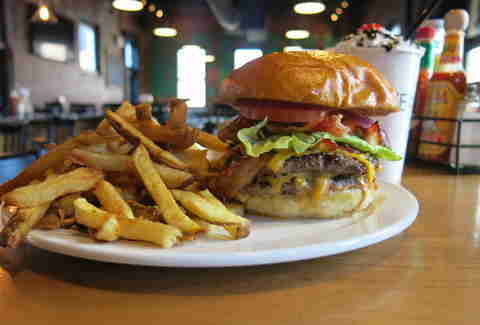 Arkansas hasn’t been overrun with gourmet burger restaurants, but one of the few we have is damn good. Big Orange has house-ground turkey patties and veggie burgers, but opt for the all-natural beef. 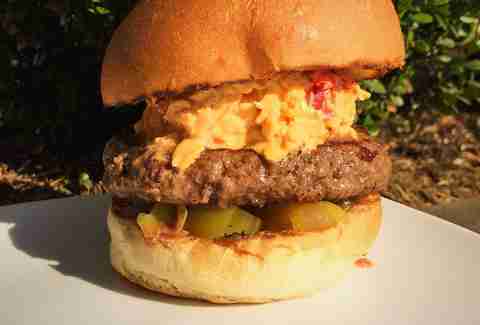 And while the white truffle and pecorino burger is equal parts fancy and tasty, go full-Southern and try the spicy pimento with -- you guessed it -- house-made spicy pimento cheese and a green tomato pickle. Skip the bathhouses, Oaklawn’s horse racing, and the mob museum in “America’s first resort” and head to BubbaLu’s for a cheeseburger fixed 1950s diner-style. They’re hand-formed, cooked to order, and layered on a sourdough bun. Pro tip: there’s only one cook, so get here early or late -- the line gets long. Housed in a circa-1917 building and coated in a century of dust, Cotham’s is a piece of Arkansas history and a longtime favorite of political sons like Bill Clinton and David Pryor. The Hubcap is worth wading into farming country to try, even if the 2/3lb Hubcap necessitates you skip breakfast. It’s hand-formed, obviously huge, and should be ordered with the onion rings that’re justifiably famous. 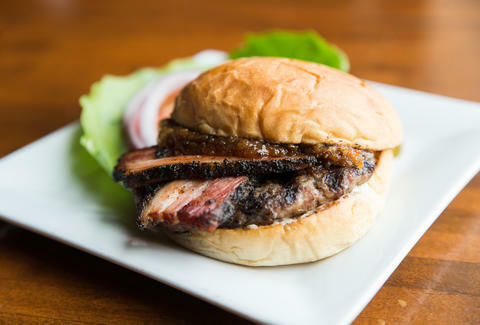 With apologies to Fayetteville legends Hugo’s and Feltner Brothers, this newcomer might just be putting out the best damn burger in Arkansas. The patties are 1/4lb, flattened, and caramelized diner-style to good effect. The buns are buttered and toasted. The namesake burger is served in traditional diner style: with American cheese, grilled onions, and the Thousand Island-type “Deluxe sauce,” plus bacon. You can customize with more than a dozen add-ons, and you should definitely get a double. And a milkshake. With directions like “take the Pig Trail ‘bout 15 minutes past Elkins,” this combination gas station/convenience store/cafe is pretty much exactly what you’d expect. But the Hooshburger’s half-pound of fresh-ground beef with onions and spices cooked in, American cheese, and the best hamburger bun in the state make it well worth overcoming your fear of banjo music to break bread with some genuine Ozark hill people. Andy Albertson lives in Fayetteville, and thinks everything goes better with pimento cheese.